Probably the Simplest GPS Disciplined Oscillator possible ! Using the GPS Satellite system offers the advantage of very accurate timing and by extension, frequency control. The long term error is to all intents and purposes zero, with time and frequency accuracy being comparable to the international standard. The traditional route is to use a relatively low cost GPS receiver module which outputs a 1 Pulse per second signal (1 PPS) aligned to UTC. Basic GPS modules such as the Garmin GPS25 and Motorola Oncore have been around for some years and are available at low cost. It is possible to phase lock a divided down crystal oscillator to this 1 PPS signal and transfer its long term stability to , say, a 10MHz reference which is subsequently used for deriving any LO and beacon frequencies. The subsequent PLL system is usually described as a GPS Disciplined Oscillator rather than locked, since it is not, strictly speaking, actually ‘locked’ to the GPS system at all; just controlled by it via the 1 PPS generated by software in the receiver module. The first GPSDO to appear in the amateur press was by Brooks Sheera W5OJM, described in QST July 1998. A lower stability simpler version, suitable only for low data rate signalling on the LF bands, was published by myself in Radio Communication October 2002. Both of these, in different ways, demonstrates the problem with using the 1 PPS signal. On all these receiver modules the 1 PPS signal can have up to 1us variation from pulse to pulse, and this varies randomly. Later modules reduce to a few 100ns, but it is still there. Consequently, for a frequency standard with a short term stability measured over a few tens of seconds, this 1 PPS jitter has to be averaged out over many hundreds or thousands of seconds - so giving very long lock up times and loop tracking constant. Now, as the PLL has a time constant of many tens of minutes or hours, the voltage controlled crystal oscillator has to be stable over this loop time constant - particularly if it is to be multiplied up to GHz where a short term wander of a few Hz (parts in 10^-10) is noticeable. So a good quality oscillator has to be used here - typically an ovenned high spec standard in its own right. This was the approach taken by W5OJM with a microcontroller based digital PLL and loop time constant of hours. My design went the other way, and accepted a poor short term stability for LF use only, where the phase wander over a few seconds was inherently averaged by the LF signalling interval. Many manufacturers now offer off-the-shelf GPSDO modules with varying specifications between these , ranging in price from a few hundred pounds, to thousands. Which brings me onto a new GPS module that makes a homebrew solution very much easier. 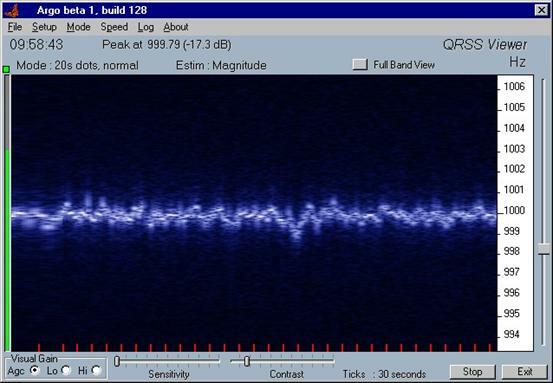 The Jupiter-T module made by Navman (originally Conexant) has an output at 10kHz ‘locked’ to GPS time. Initially I was sceptical thinking it probably only consisted of 10000 pulses per second - which could have been no better than the 1 PPS signal itself in the short term. However, after making extensive measurements, came to the conclusion it really was quite a respectable signal - in particular I could not detect any discrete sidebands at sub Hz frequencies. This suggested a simple GPSDO solution. By taking a simple low cost 5MHz voltage controlled TCXO (VTCXO) module and dividing down to 10kHz, this can be phase locked to the output from the Jupiter in an analogue PLL with a time constant of a few tens of seconds. The R/C values forming the PLL filter are optimised to my particular VTCXO which has a sensitivity of 125 Hz/V at 5MHz, and a required tuning voltage in the 0 to 1.5 Volt region. As the bandwidth and tracking performance of the PLL depends on this filter, it is worth spending a bit of time optimising the values in this area. The 200th harmonic of the 5MHz output, at 1GHz, was monitored on a UHF communications receiver in CW mode and the output at 1kHz monitored with Argo to show short to medium term frequency shifts. All the local oscillators in the receiver were locked to a Rubidium frequency standard that has been calibrated to an accuracy of a few parts in 10-11. At 1GHz, a frequency shift of 1Hz corresponds to 10-9 frequency error. Figure 2 shows the plot after the system has locked up and been running for about 30 minutes. It can be seen that the frequency is maintained usually within a couple of Hz, and randomly wanders over a mean period of something like 20 - 30 seconds - this being a function of the PLL bandwidth. The breadboard which produced these results was lying open on the bench, and susceptible to perturbations when I touched it - it is quite possible this trace would be cleaner still if the unit was packaged in a screened metal box. Figure 3 shows the effect of disconnecting and then reconnecting the GPS antenna. Presumably, the quite fast variation during the period of no GPS signal is the GPS receiver going through its search routine to find the satellites. The faint line that remains fixed at 1kHz exactly is caused by leakage from the Rubidium source controlling the communications Rx. 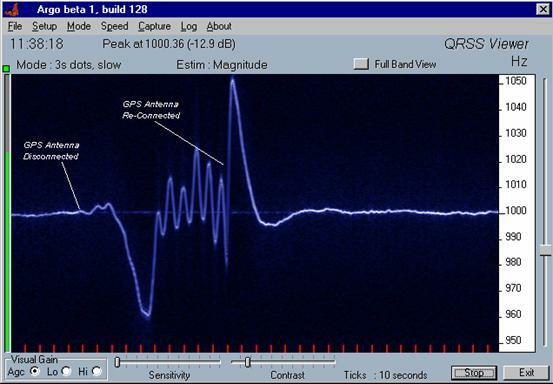 Figure 3 Frequency tracking with loss and re-acquisition of GPS signal - multiplied to 1GHz. This design is based around one specific GPS receiver - others with a 10kHz output may be available, but I don’t know of any. This is the Jupiter T GPS Timing Board. In the UK it is available from TDC Ltd in Basingstoke, www.tdc.co.uk , tel +44 (0) 1256 332800. Their Stock number is TU6-D120-041 The cost is around £86 which is significantly higher than a navigation only receiver module, but worth it for the frequency tracking capability. The board is available with a variety of GPS antenna connectors, but they are all fixed by a standard 5 hole fitting and can easily be replaced by SMA, SMC etc. Full data sheets are available from the TDC website.